– We often hear or say “If it is God’s will, it will happen”. But have you noticed? We usually say this when we are not enthusiastic in any work we want to do. Many say “We will do Sadhana, when Guruji will want us to do but We don’t say “If it is God’s will that I should eat food, it will happen” nor we say “If it is God’s will that I should see movie, it will happen”, but we often say in work that we are not enthusiastic to do. Somewhere if we win we say “I have won” and when we fail we say “it could be God’s will” such people are called one who only love to stay in their comfort zone. We misuse this beautiful sentence and apply it to our own comfort zone. There is a saying ; Saint Mulka has said this to some other relation and we took this up and messed up everything. Whatever effort you do 100% physically and by being mentally with it is itself called Shiva. If you are considering Lord as Dourer then you are not Sufferer as well. If you say “It was Lord who made thief to steal” then it will be the “Lord who will suffer in Jail”; then where does the thief come in between. – Whatever task you want to carry just complete it out. Thinking on it again and again will end up nowhere. The work which you want to complete, complete it and the work which you want to leave, leave it and relax. That’s it. The will to do in you is itself Shiva. Krishna says to Arjuna means “Having an equal mind in happiness-sorrow; gain-loss; victory-defeat; engage in battle and thereby you will not incur sin”. Knowing that everything is happening by itself you become observer. The digestion process in you is happening or you are doing it? It’s happening, right. So knowing this that everything happens at God’s will; You become ” (witness)” of it. But at the same time Never remain inactive. First Work and then Relax.
. You become God’s messenger by carrying out some noble work. You don’t make luck if you don’t work; similarly by just doing work you also don’t make luck. You need skill at the same time. A smart work is always appreciable than hard work. 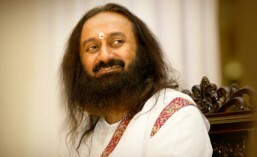 Many people ask me “Guruji, why do good people suffer and bad people enjoy”. I tell them “Good people never suffer, if they suffer then its because lack of skill in them”. You don’t need skill to become unhappy? Do you? No. But you need skill to become happy. Thus it is said means Become aware and skilful for the unhappiness that may come up in future.